Last week, I walked past a colleague, Sonny, and spotted him using the LG G3. The conversation went something like this. "Did you review the LG G3?" "You should. It is the best Android phone experience I've had." With that challenge, I requested for an LG G3 smartphone for a review. The LG G3 is a 5.5-inch quad-HD (2560x1440) smartphone, the highest pixel density by far. Its curved rear is glossed metallic-brushed plastic. The display maxes out to the side bezel to give maximum coverage without feeling too large to handle with a single hand. I would prefer it to be slightly narrower, but it's nothing I cannot handle. The power and volume buttons as located at the back, just like every other latest LG smartphones, but you actually do not need to access them much, since turning on the screen is simply double-tapping on the screen. 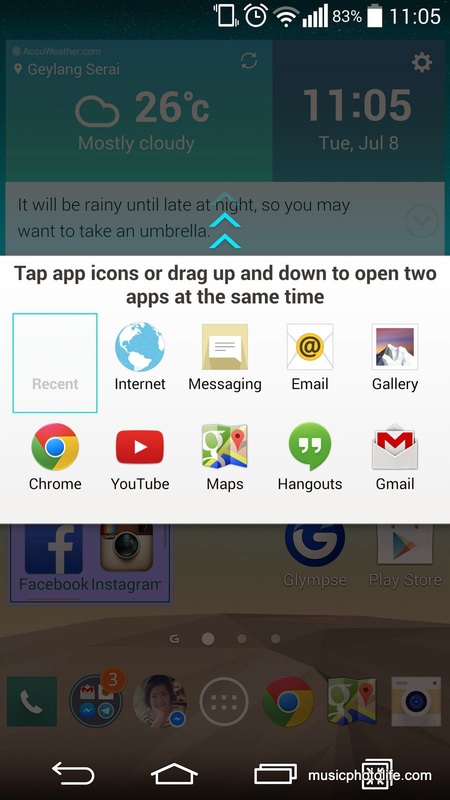 Similarly, turning off the screen can be done by double-tapping on the home screen. Adjusting volume can also be done via the pull-down notification panel. The 3.5mm jack and micro USB port is at the bottom. A small IR-blaster and 2nd mic can be spotted at the top. Disappointedly, the mono speaker is located at the rear, which means I lose a fair bit of audio when watching videos. Nothing beats HTC front-facing stereo speakers. The rear battery cover can be removed to reveal the innards where you insert the micro SIM card, micro SD card, and the replaceable 3000mAh battery which is a favourite for heavy phone users where they can buy additional batteries to last a day, though I find it unnecessary for my kind of use. Knowing that camera is a big part of smartphone owners, LG G3 has sought improvement on the camera shooting experience. The 13MP optical image stablized camera has a laser auto focus, supposedly to improve AF speed in low light situations. Personally, I don't observe any benefit in focusing with laser. It does not appear to focus any faster than other smartphones, but I think it does help in achieving accurate focus at low light. The camera actively auto-focuses whenever you reframe, and the screen displays the AF points like a DSLR. The camera interface is clean and simple, and there aren't any advanced features like EV, ISO, shutter speed adjustments, or user scene modes like fireworks or beach, except Dual (front and back camera), Panorama, Magic Focus and Auto. You can either shoot with the usual shutter button (default) or you can remove all buttons on-screen and fire the shutter by tapping the screen. A very useful feature has got to be the gesture initiated countdown capture via the 2.1MP front camera. Just raise your hand, wait for the camera to identify it with a bracket, then close your hand into a fist, then the countdown will start. You can also easily adjust the level of skin-smoothening effect before taking a selfie. HDR is automatically enabled by default, and the camera will capture in HDR when it detects a scene with high contrast details. Capturing a HDR image requires a little more time to save the image so you need to wait a while before taking the next shot (the shutter button will be greyed out during this time). Doing burst shot is simply press and hold the shutter button, up to a maximum of 99 shots. You can do burst shots using either the front or rear camera. G3 also has a Magic Focus mode where you can adjust focus after a shot. However, you can only adjust immediately after each shot. If you exit, you will not be able to re-select your focus area. In terms of camera quality, I find the G3 images are very much improved. There was no hint of any muddiness (water painting effect) as observed in earlier models. Even under low light, the camera is able to capture sufficient image details and noise reduction is also well-controlled without looking overdone. I think most consumers will find the revamped camera app very useful and simplifies shooting , but advanced photographers might find the features lacking for manual controls. My favourite feature that LG introduced across their latest smartphones is Knock On, where you can wake up the phone by tapping the screen. Similary, you can turn off the screen by tapping the home screen. On G3, it has been enhanced to support Knock Code. 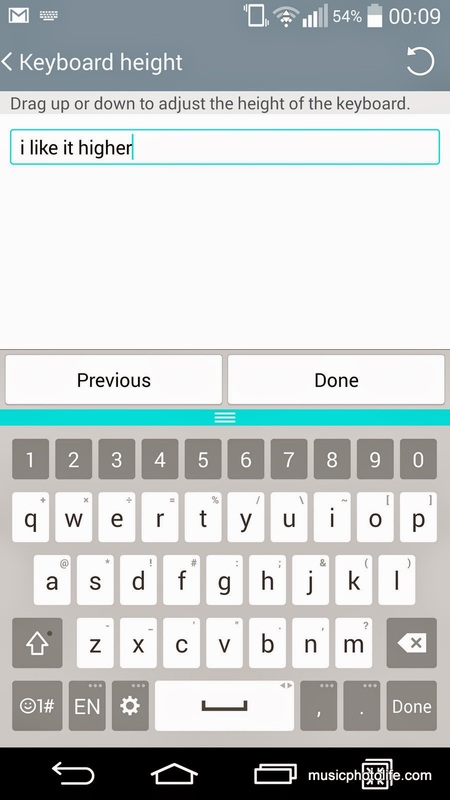 So, on top of the existing Android unlock options, you can unlock by tapping 3-8 tap combination within a 2x2 area. 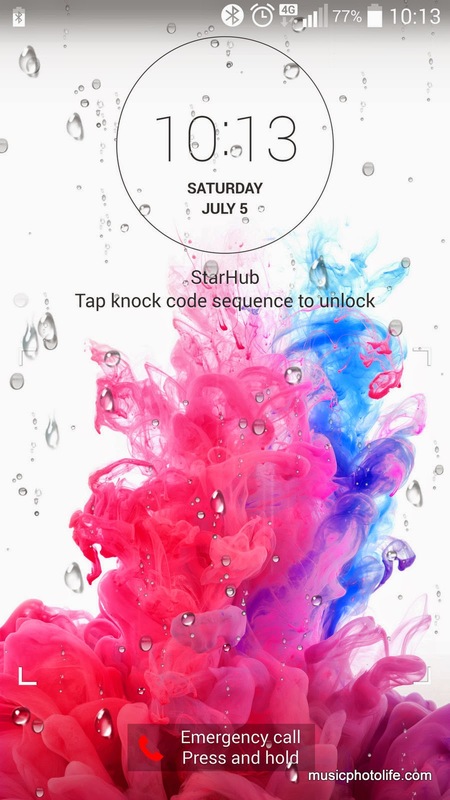 The good thing is that you can immediately tap your Knock Code to unlock from standby, while other unlock methods require you to turn on the screen. 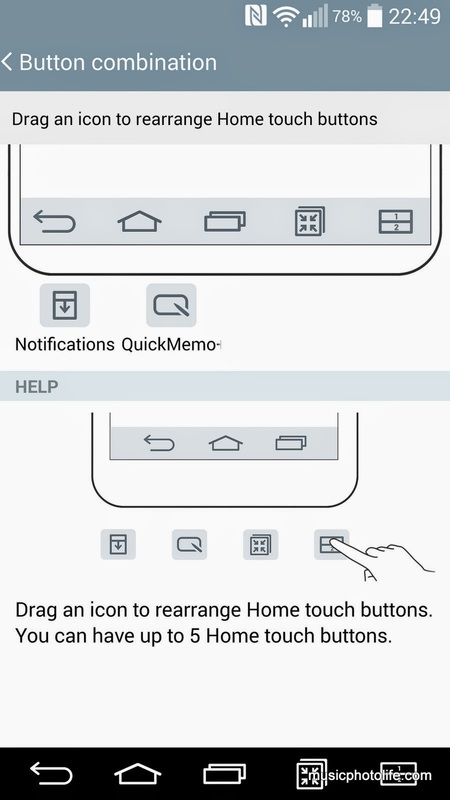 Another feature unique to LG is the ability to customise the home button layout. On G3, I can add another 2 keys next to the existing 3-buttons and re-arrange the buttons in any way I want. The G3 is the first LG smartphone that introduces a refreshed GUI, adopting circular icons inspired by LG's own logo. LG's answer to a Google Now-like personal assistant feature is Smart Notice, which prompts tips, suggestions and recommendations based on user behaviour, phone usage patterns and location. 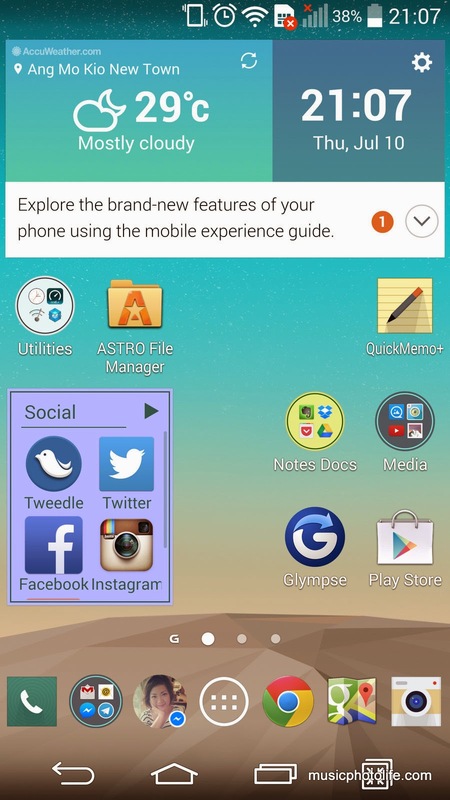 I like that LG G3 allows more apps icons - up to 5x5 - to be inserted on a single home screen. While it is easy to install and use third party keyboard apps, I always prefer pre-installed apps for their native support. G3 keyboard includes additional number row so that you don't need to switch layouts. You can also adjust the height of the keyboard and customise 2 keys next to the space bar to define your commonly used punctuation. LG G3 has content lock built into the Gallery app, so you can lock and hide photos and videos to prevent casual view. Again, while you may easily get this feature via third party file manager apps, it is always better to get these features natively. 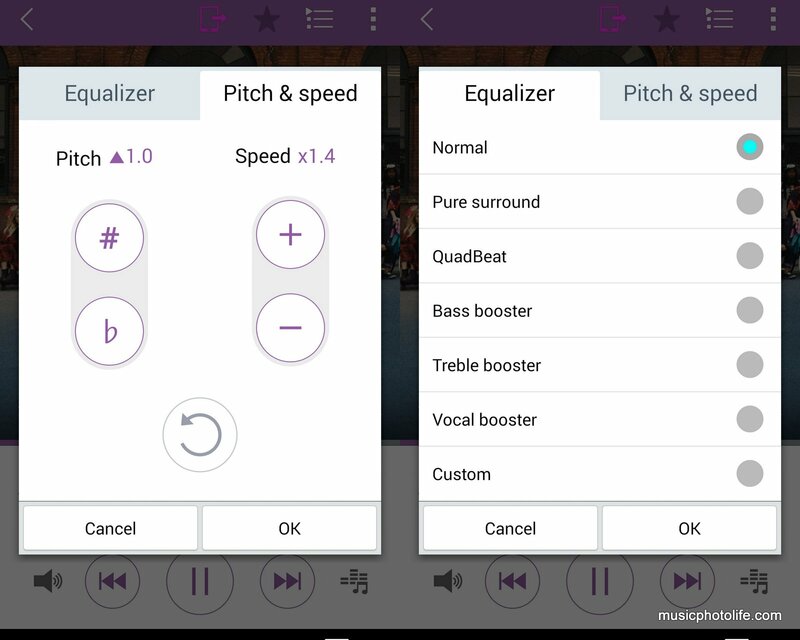 LG G3 music app has an additional feature that is rare among stock music apps: it can adjust pitch and tempo (speed) of the song! I thought this is a really fun feature and great for karaoke or learners of new songs. LG G3 has implemented the most recent app view in a different way from stock Android. The most recent apps are displayed on top rather than at the bottom, so it requires some getting used to. But I like that you can adjust the thumbnail size of the list to display by 3x3 or 2x2 or single row list, via pinch and zoom. This is LG's answer to Samsung's floating window. LG is better as you can fade out the app to the background while continuing to interact with the main screen. Again, LG's version to Samsung's Multi-Window. The G3 offers no change since the earlier LG smartphones, which is a little disappointing. There are so much potential that LG could improve on this, just like what Samsung has done. LG G3 has quite a load of unique features as mentioned above, many of which I have experienced while reviewing earlier LG smartphone models like Optimus G, G Flex. While I have high regards for these features, there are some characteristics of the G3 which I do not quite enjoy as much as before, and I have to say these opinions are very personal, and I struggle to understand why I feel this way. This is unlike other smartphone reviews where the opinions are somewhat more objective. First off, the LG G3 bears strong resemblance to Samsung Galaxy series. If you are a Samsung UI lover, then G3 will be an instant love. 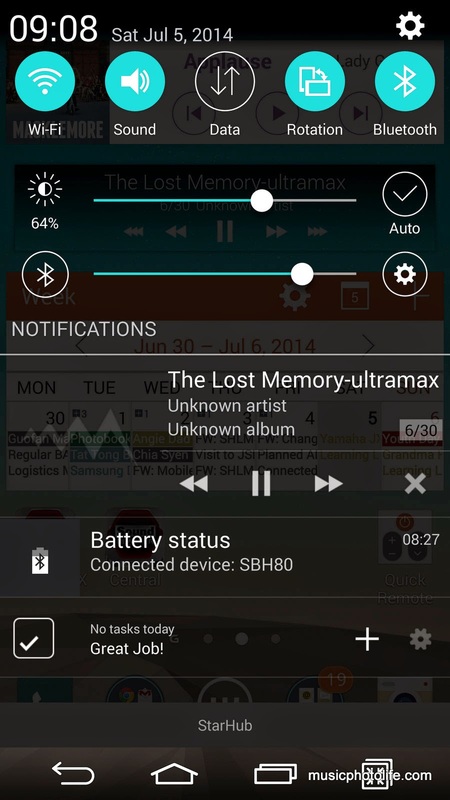 But for me, I find the Samsung TouchWiz UI is dated, and the recent cosmetic fix does not attract me any much more. The G3 has the same shortcut menu in the pulldown notification window, has multi-window and pop-up apps (QSlide) albeit different implementation, same bright colour themes, same lightweight materials, same ability to remove back casing and replaceable battery. The G3 even has the same UI lag as Samsung. Tap the home button and it takes a heartbeat for G3 to close and revert to the home screen. When fading out the QSlide apps, there is an initial retard. Sliding the apps to minimise to the sides also appears to lag. I don't recall getting such lag when reviewing the LG G Flex. Overall, there was no immediacy that iPhone or HTC One users come to enjoy. And about the QHD screen, while the colour reproduction appears good, I do not find any visible advantages of spec-ing a 2560x1440 display on a 5.5-inch screen against a normal 1920x1080 HD display. The display sharpness, even if present, appears to be exaggerated by the graphics processor. After all, there aren't many native QHD content, so the G3 ends up having to extrapolate the content. I suppose this over-sharpening effect could be fixed in subsequent firmware updates. As for the keyboard, I am underwhelmed that it does not offer next word prediction. On top of that, word prediction comes out to be slow: prediction words only appear after you pause keying. Fortunately, you can always replace the keyboard with third party alternatives. To nitpick further, LG continues to place the speaker at the rear. I think it's time all the phone manufacturers spend some effort to move the speaker to the front. Sony has made the move on Z2 following HTC footsteps, and it is the logical placement. I like the LG G3's lightweight. I like the Knock Code. I like the customisable home buttons. I like the ability to add more app icons per home screen page. I like the higher camera pixel and less-contrasty more post-processing friendly images. I like the simplified camera app. The QSlide and Dual Window feature, while useful, is limited to a few pre-installed apps. But I find myself drawn back to my HTC One M8. The HTC Sense UI is less laggy, more responsive, has cleaner modern UI design, better front-facing speakers, and a build quality that your hand will love. The 16GB retails for S$868, while the 32GB retails for S$928. Visit this link for StarHub LG G3 promotion. Chester blogs at http://musicphotolife.com/ , about Music, Photo, Gadgets, and Life.